Yeah thanks Miro and please a 4 channel version ! I’m definitely going to try that! I’ve been looking for something like that for a while but, finally, with an IC. Question: As I understand this mixes the effect with your dry signal, so there are no losses if let’s say the second effect is turned off and non true bypass right? It is not a headphone amplifier - just a summing amplifier with two inputs and one output with variable input levels for both channels. So if you are feeding a line signal from a pedal to it - it comes out as line signal and in mono. It has option for headphone out. So you built this mixer and it works as intended? how bout a vero for a good active DI box? I've drawn one, but i won't publish it before i can verify it myself (not too simple circuit) - I'm waiting for 22µ non-polar caps to arrive. Once i've verified it, it will be published. I would like to use this on my pedal board with a EHX superego. I use effects in the loop of the superego but I dont want the effected sound fed into the distortion after the superego. my plan would be to run the guitar into the superego, connect from the super ego send jack to a chorus and delay and then instead of using the return jack on the superego use this 2 channel mixer. the inputs of the mixer will be the effected superego synth tones and the guitar signal that has been distorted after passing through the superego's output. will this work? Can i delete the volume controls on the mixer and use it as an active combiner? The superego has separate dry and effect level controls. What's D1? Also, could I use this with say, a fuzz circuit to have two separate controls for clean and effect in a single pedal? Yes, I'd love to know what D1 is! A diode. In this case, a polarity protection diode in series with the supply. 1N5817. I build this mixer yesterday. but it's volume a little decrease more than bypass. Hi, can i use 10k linear instead log? Thanks for the layout! I built it up tonight (unboxed so far) and it works well, but there's a slight, but noticeable hiss. I swapped the TL072 for an NE5532 and that seemed to help somewhat (to my hopeful ears, anyway). The only other substitution I made was a 1n4001 for D1, as it's just a polarity protection diode and shouldn't matter anyway, right? I ended up solving my hiss issue by socketing the 10K resistor and increasing it slightly to the point where the overall output was slightly lower, but still loud enough for lots of gain in the 2 channels. Thanks! I've missed your posts completely. I'll tag the layout asap. Cheers Paul! Finished my own build of this one today. Tried the box out with Ibanez SC10 which has inverting stereo output. The sound gets fun and weird when you mix the non-inverted and inverted together at nearly the same level. Fun thing. Hi Paul, I have a hiss issue with this mixer as well, I would like to ask you where in the scheme/pcb did you put that 10k resistor? I am using NE5532.Thank you very much. However. You should take into account that your synth is giving out line level signal, while your bass is giving out only what it can with its pickups. This means that you'll want to lower the synth's output level before it's sent to the mixer. awesome thanks, it will actual be some midid foot pedals controlling annimoog so it should be pretty easy getting the volume down. Thank you for this fantastic layout ! Id like to add a little mod : 2 outputs and a switch. And a question too , do this mixer work on 12v alim ? But that other thing.. Not so simple. 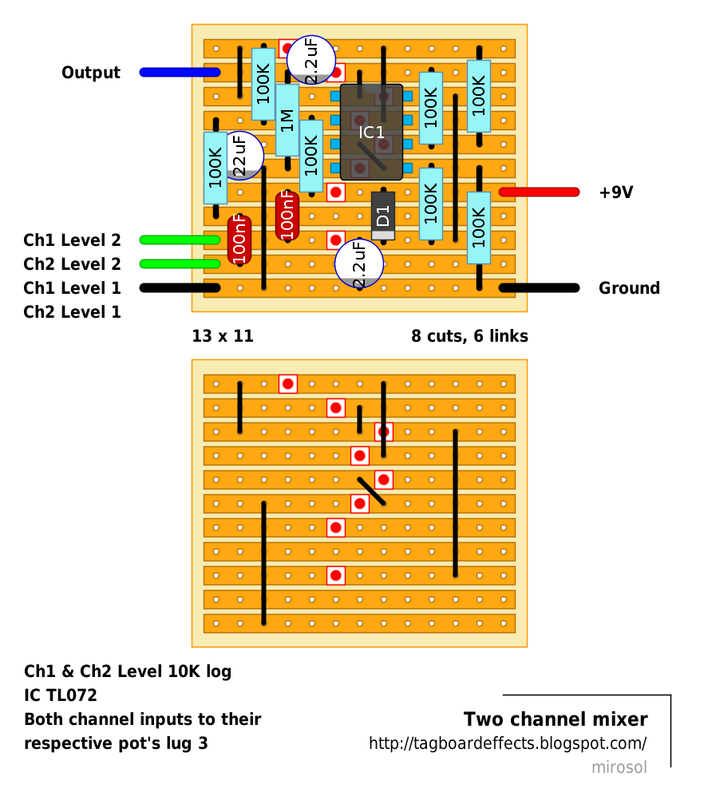 The circuit is 2 channel mixer, so you'd need a splitter circuit for the second channel before the mixer input and then figure out the switching for the ouputs. And even then you'd probably run into impedance mismatch on ins and outs. argh I need exactly the same thing! I've got 2 channels with their own passive tonestack, then a JFET buffer each, then this mixer; that's what I plan to do. So impedance mismatch?? Hi Mirosol, I want to use it to play two acoustic guitars (with piezo preamp) in one acoustic guitar amp, could work also with high piezo impedance? correct me if I'm wrong, but I just need to connect the Input 1 (Out A on the layout) TIP to Channel 1 Input, and Input 2 (Out B) TIP to Channel 2 Input ? Should I invert the Stereo Jack they've named Input (Out for me) to MY Input 1 (Out A) -with the wiring for the battery- ? I have some phase issues with this. Are there any quick fixes? Hi! I have build this mixer and I get the sound too low. Someone same thing happens? Please correct me if I'm wrong here, can I put 2 of this 2-channel mixer (one for left and 1 for right) then it'd become a stereo mixer? The pots would be dual ganged too. I finished the mixer. Build It without the pots. Changed the 10K to a 100K because the output was to much amplified. I have the hiss issue to. Anyone a idea how to silence the mixer?? I put a picture of my build on photobucket.